Why make Kirsten Gillibrand suffer for what Al Franken did? New York Senator Kirsten Gillibrand did not destroy Al Franken’s political career. But try telling that to the Franken-stans. These are the obsessive supporters — “stans” — of former Minnesota senator Al Franken. As the #MeToo movement garnered worldwide attention in late 2017, several women accused Franken of inappropriate behavior. As the allegations piled up, Gillibrand pushed for her fellow Democrat to “step aside.” In a speech with more defiance than contrition, Franken resigned less than two weeks later. Now that Gillibrand is running for president, some who once imagined Franken in the Oval Office — or at least staying in his old office — are chafing at the idea of doing anything to help a woman they blame for Franken’s political demise. Yet again, a woman is being called to answer for the consequences of a man’s recklessness. “Once the whole thing happened with Al Franken, it was confirmed 1 billion percent that she’s not to be trusted,” one Democratic donor told Politico in November. Last month, The Atlantic reported that deep-pocketed Democratic donors like George Soros and Susie Tompkins Buell resisted the idea of a Gillibrand presidential run. Recently, CNBC claimed the New York Democrat received “a mixed reception” from Wall Street executives still bitter over her drive for Franken’s resignation. In going after Franken, Gillibrand did what she has done throughout her political career. She listened to and amplified the voices of survivors. That’s what she said less than a day into her presidential candidacy when she was peppered with questions about whether being vocal about Franken’s scandal could cost her with some donors. Notice how much less attention is paid to the accusations and accusers than to whether Gillibrand should have ignored them. Gillibrand also raised eyebrows within her party when she said President Bill Clinton should have resigned over his relationship with Monica Lewinsky. All these years later, I can’t imagine she’s the only Democrat to believe that; she just said it out loud. (The Dems’ love for the former president is lost on me.) That’s also what she did when she led the call for Franken’s resignation. She was soon joined by more than two dozen other Senate Democrats, including Senator Kamala Harris, a likely presidential candidate. It was a reckoning within the #MeToo reckoning. For that moment to become a movement, all offenders had to be held accountable. This meant going beyond easy villains like Bill Cosby and Harvey Weinstein. It would include the actor you liked, the musician whose songs gave your life its soundtrack, and the comedian who helped some women in the industry while derailing the careers of his victims. It would also be a liberal stalwart like Franken. He had to go. If Franken had been a Republican, Gillibrand would be hailed as a hero. That’s what she’s been for many in this nation’s community of survivors, from campuses to the armed forces. She has drawn the ire of Pentagon officials with multiple reports detailing the pervasiveness of sexual assault in the military. Last year, Gillibrand co-sponsored with Republican Senator Thom Tillis the Military Family PROTECT Act to support the military’s prosecution of child abuse and domestic violence accusations. 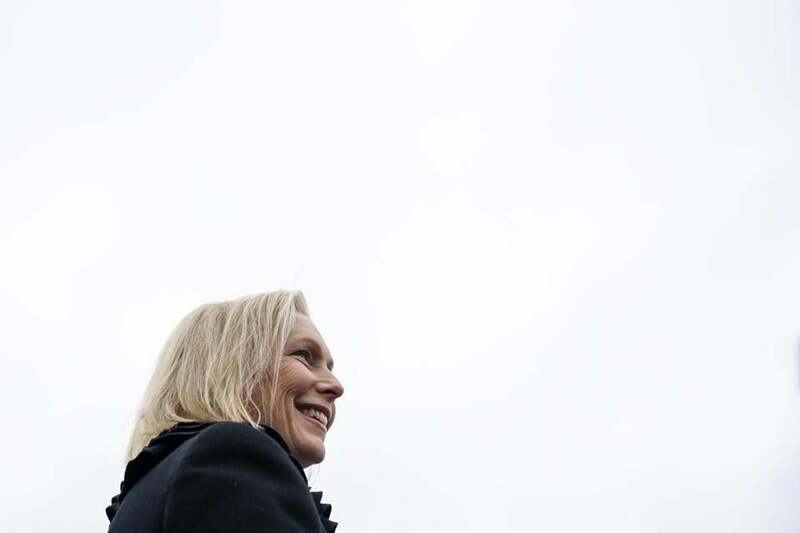 In announcing a run for the White House, Gillibrand joins Senator Elizabeth Warren, former Housing and Urban Development secretary Julián Castro, and Representative Tulsi Gabbard of Hawaii. More are expected to join them in the coming weeks. Gillibrand should be grilled on her voting record as senator and the policies she would pursue as president — not on whether Franken’s punishment fit his actions. He chose to resign, just as he wrecked his own career. It’s too soon to say whether Gillibrand can earn her party’s nomination. Yet even the Franken-stans should admit that Democrats could do a lot worse than having a champion of survivors take on a president with a list of sexual misconduct allegations as long as a CVS receipt.